As much as I’m enjoying experimenting with my low-sugar recipes, sometimes life just calls for a bit more of the white stuff (the legal kind). 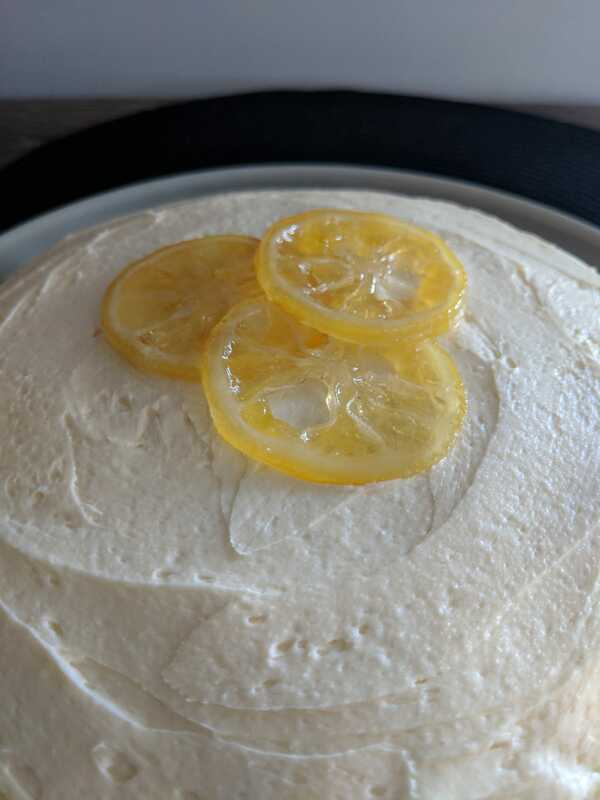 So I made this lemon cake with normal caster sugar and tried my hand at buttercream frosting using some very clever tips from a few YouTube videos (thank the Lord for the internet!) The result? 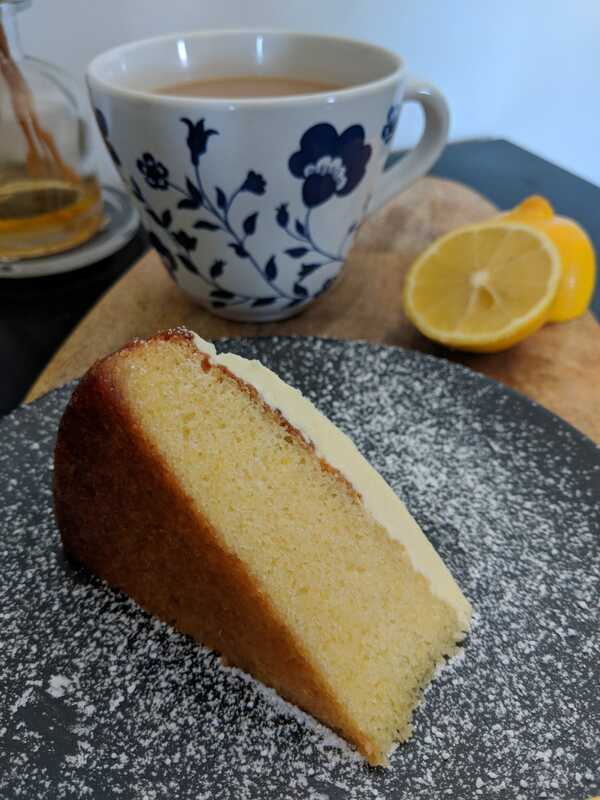 A light, yet indulgent lemon cake with a tangy, fluffy buttercream to top it all off – perfect with a good English cuppa. I even made some fanciful candied lemons for an extra bit of pizzazz! Beautiful if I may say so myself! TIPS: If you want to add the candied lemons, you can make these in your sugar syrup and then use the leftover syrup to drizzle over your cake. 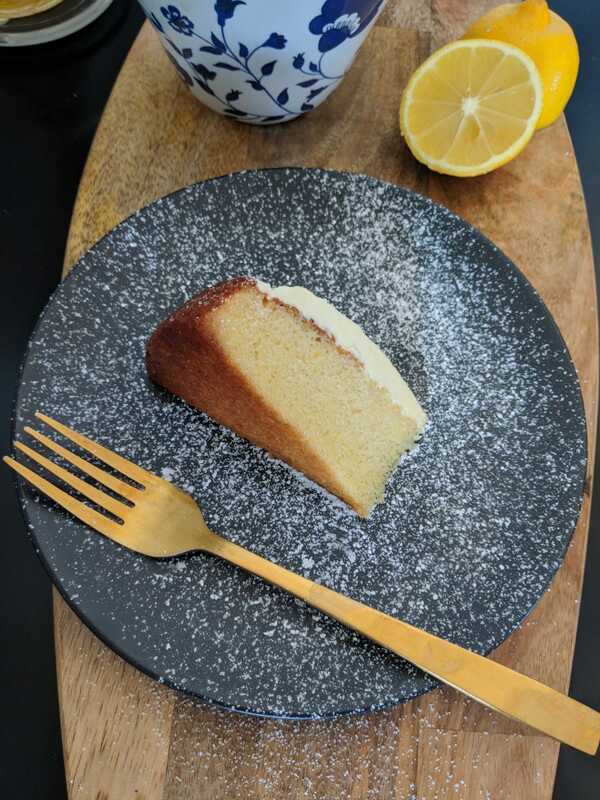 I’ve included separate cooking methods just in case you don’t want to add the candied lemon slices to your cake (it is extra effort after all). Either way, the sugar syrup adds an extra bit of moisture and sweetness (especially when it gathers at the bottom of the cake *licks lips*). Remember to add lemon slices if you want to make candied lemons together with the syrup! Recipe if you want to make these separately to the sugar syrup! 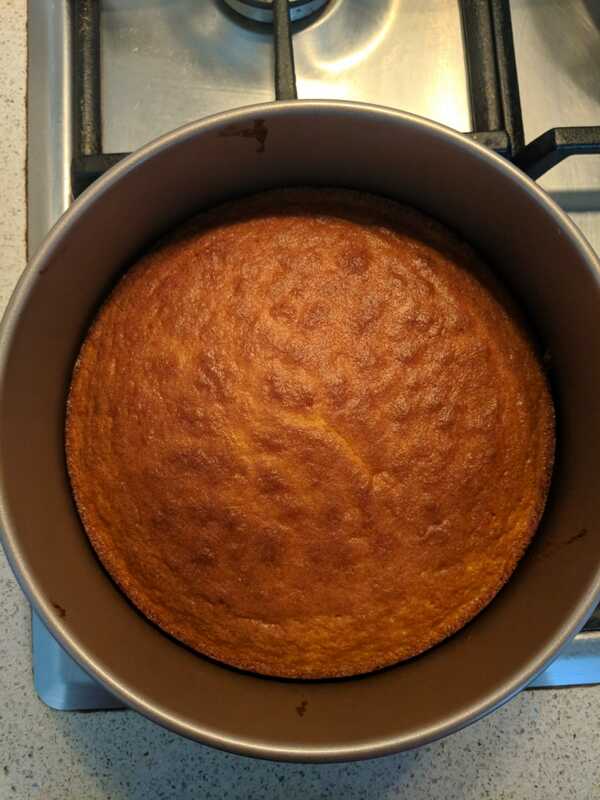 Perfectly browned in my new cake tin! 1) Pre-heat the oven to 150 degrees Celsius (for fan ovens). 2) Lightly line your cake tin with a bit of butter or oil. 3) In a separate bowl, whisk together the butter, sugar, vanilla and milk until light and fluffy. 4) Add the eggs in one at a time and combine. 5) Grate in the lemon zest and combine. 6) Sift in the flour and baking powder and combine until you have a smooth batter (add more milk if needed). 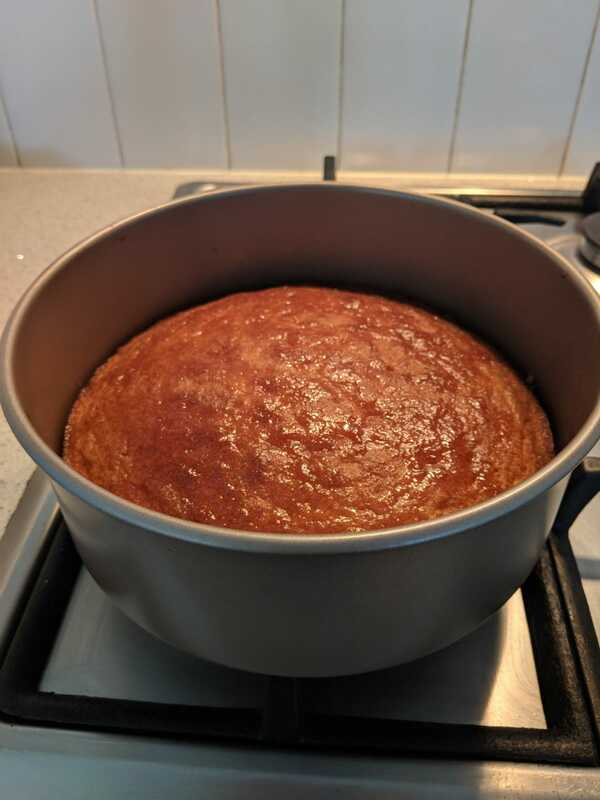 7) Pour the batter into the cake tin and bake in the centre of the oven for around 30-40 minutes until nicely brown on top (my oven cooks really quickly!) Leave the cake to cool in the tin whilst you prep your sugar syrup. Reserve a few slices of lemon for the candied lemons if you wish to add them on top! 1) Juice the lemon and add into a small saucepan with the sugar and water. 2) Bring to the boil, shaking the pan every so often to combine. 3) Once the sugar has dissolved, reduce the heat and simmer for a few minutes until a syrup texture has formed (this will become more syrup-like once cooled). 4) Poke holes in your still-warm cake using a skewer (all the way through to the bottom). 5) Carefully pour the syrup all over the top of the cake and leave to cool in the tin. Make in the same pan with the sugar syrup to save washing up! 3) Once the sugar has dissolved, reduce the heat and add the lemon slices, making sure they are covered in the liquid and not lying on top of each other. 4) Gently simmer, turning the lemon slices occasionally, for around 15 minutes until the lemon slices have softened and a syrup has formed from the liquid. 6) Poke holes in your still-warm cake using a skewer (all the way through to the bottom). 7) Carefully pour the remaining syrup from the pan all over the top of the cake and leave to cool in the tin. Try to cut the slices just thick enough to hold their shape! If you want to make a more lemon-y topping, add in some lemon zest! 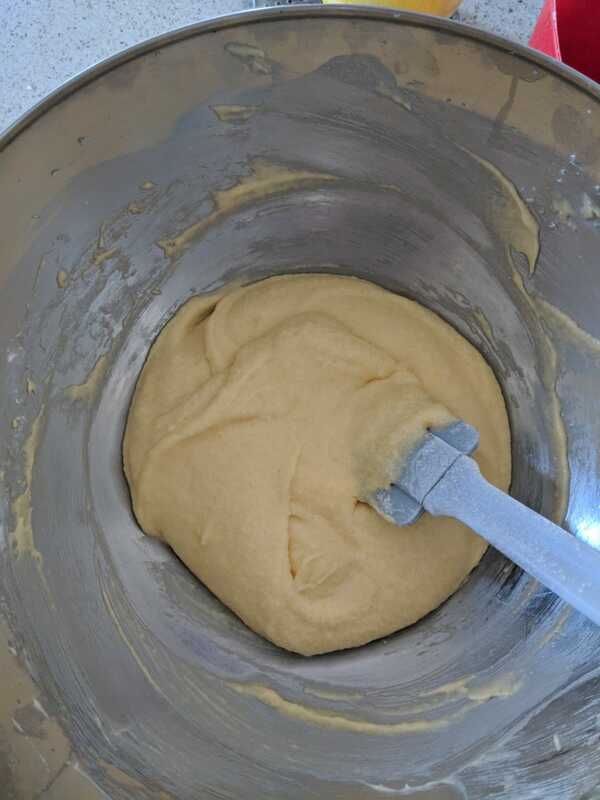 (PRO YOUTUBE TIP: use an electric whisk or stand mixer and beat on high for around 5 minutes to make the butter incredibly light and almost white in colour). 2) Carefully add in the vanilla extract and icing sugar and combine with a spoon before whisking for a further 2 minutes. 3) If your mixture is too stiff, add in a tablespoon of milk, whisk again and test. The icing should be almost like whisked egg whites in texture, soft enough to spread onto your cake but firm enough to hold its shape and not drip everywhere! 4) Once your cake has cooled completely, remove from the tin and spread an even layer of icing on top. Top off with your candied lemon slices or a twirl of lemon zest to impress any tea party. Delicious indulgence without that heavy, full feeling after a big slice! 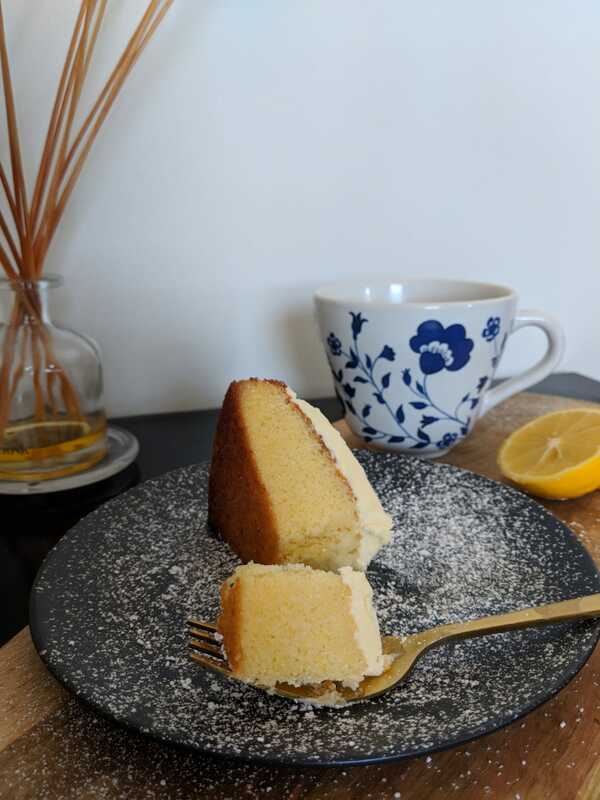 Lemon cake is perfectly light and great for morning tea or dessert – and who doesn’t like lemon! That’s what I call a crumb! What’s your favourite gluten free cake flavour? Are you more of a fruit-loop or chocoholic?